I walked through the halls of the elementary school looking at all the Christmas art and enjoyed myself. 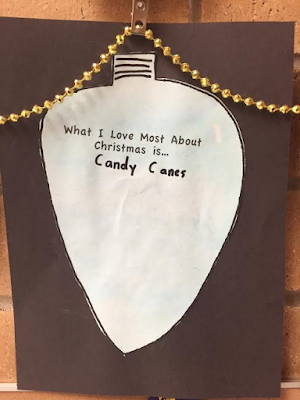 The second grade corner had done a little beaded ornament cut-out with the line printed reading, "What I love about Christmas is..." and then the kids wrote down their answers. A pan of homemade orange rolls--WHAT. They were amazing. A flipping THREE-LITER of Sprite. We'll see how long this sits on our counter. And a case of candy canes. CANDY CANES. And this was like three days ago, a mere week before the day itself. Obviously these people are just getting rid of their junk in their house. I mean, a single candy cane would have been awful. I guess I'd accept it if it was dressed like a reindeer. But a whole box?! What kind of friend are you?? It makes me give serious side eye to some people sometimes. I mean really, just what are you playing at.